The figure at the right hand side shows a model of a ceramic ball for hip replacement. The FE analysis was performed to evaluate the stress distribution in this component caused by the conical coupling between the ball and the stem. Often the problem is simplified by applying an internal pressure to the ball or by using displacement boundary conditions for the inside of the ball. A realistic FE analysis can only be done by simultating contact and friction between stem and ball which can be performed in our FE program. The evaluation of the material strength was done considering failure criteria for brittle material. 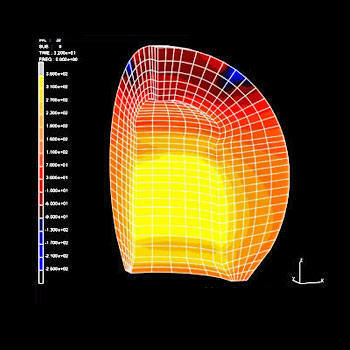 Small differences in the angle between the conical areas of stem and ball cause great influences in stresses and can be simulated using the contact features of the FE program.The developed procedure can be applied to a variety of modular connections in medical devices such as the conical cup/insert coupling. The exact modeling of the geometries especially for 'hard/hard' contact problems such as ceramic-ceramic is essential.